1 – Daniel Rosenblum the Deputy Assistant Secretary for Central Asia during his visit to the Uzbek capital Tashkent made a statement to the press in which he said: “The United States requested that Uzbekistan join the international alliance and to fight against the extreme Daesh organisation”. And he said: “The coalition that the United States leads and which bombs elements of the State’s organisation inside Syria and Iraq has a military element, this is in addition to the efforts that are aimed at preventing the influx of funding to the terrorists. The coalition gathers information about the movements of people across the borders and its efforts includes five or six other trajectories, and that Uzbekistan or any other state can choose to participate in one or more of these elements” (Reuters 27/08/2015). * So America wants Uzbekistan to join its coalition under the pretext and justification of fighting against the ‘State Organisation’ (ISIS) and against terrorism in order to tie Uzbekistan to it more strongly and to place it under its leadership. It has tried this previously when it occupied Afghanistan as it made Uzbekistan stand by its side in the war and to facilitate its transport movement and for it to reach Afghanistan. So at that time it established a base within it to guarantee the delivery of military supplies to Afghanistan. Now and under the pretext of fighting against ISIS it wants to strengthen its relations with Uzbekistan to strengthen its influence within it and to place it under its control within the alliance. * This indicates that America was looking for new styles to strengthen its influence within Uzbekistan under the heading of ‘developing cooperation in many aspects holding mutual benefit’. So this is not restricted to one aspect but rather many aspects or areas. This is therefore related to cooperation in respect to supporting America’s presence in Afghanistan as was mentioned and also related to Uzbekistan joining the American coalition in its war that it has launched in Syria. It also relates to the strengthening of the American presence within the Central Asia region by taking Uzbekistan as the launching point to the rest of the neighbouring lands that surround it in the region and these are Kazakhstan, Turkmenistan, Kyrgyzstan and Tajikistan. This is because this region as a whole is very important to America due to the great amount of natural resources that exist within it… The ‘Die Spiegel’ German news service mentioned in a report from its correspondent in Tashkent on 15/04/2015 that: “Uzbekistan enjoys a great quantity of natural resources with its large reserves of Uranium and natural gas let alone its gold mines. In addition to that it represents one of the biggest cotton sources in the world”… In addition and this is an important matter: It represents competition with Russia which still has a mixed presence and influence within the region. It also represents a region that neighbours China so America wishes to encircle China from this direction and to make its activity in that region under its control. 3 – The Uzbek news agency on 13/06/2105 published the news of the visit of the General Secretary of the UN Ban Ki moon. The Uzbek president Karimov praised “The importance of the current visit of the General Secretary of the UN to the lands of Central Asia and particularly Uzbekistan with the objective of observing the reality in the region closely and through the exchanging of views around the vital (live) issues”. It mentioned that Ban Ki moon indicated to: “The accomplishments of Uzbekistan in respect to achieving its millennium development goals, for the fulfilment of the sovereignty to the law, the protection of human rights, of motherhood, childhood and the development of the education system which occurred through the conducting of social and economic reforms targeting the human interests”. And he indicated to: “The role of Uzbekistan in providing security in Afghanistan and to the importance of signing the development support programme for the UN for the years 2016 to 2020”. The news agency added: “During the talks a number of issues were discussed relating to regional and international issues and the means of Uzbekistan’s cooperation with the UN and its departments and funds”. * Even though Ban Ki moon mentioned human rights, he did however do it in a timid fashion without focusing upon it. The UN radio on 12/06/2015 upon its website under the heading ‘Ban Ki Moon in Uzbekistan’ stated: ‘Ban Ki Moon the General Secretary of the UN met in the Uzbek capital Tashkent with the president Islam Karimov where he said: “It is not possible to realise peace and development without human rights”.. And Ban Ki moon praised the Uzbek President Karimov, “Upon his commitment to the sovereignty (rule) of law but he said that it must be the laws that are really written down for the life of the people”. And Mr Ban reiterated: “That the United Nations is ready to assist Uzbekistan in strengthening and protecting the fundamental freedoms”. Despite this point his praise for Islam Karimov and his rule did stand out as was made clear above. This is not something strange (or unexpected) from one of America’s followers as it is widely known that the General Secretary of the UN follows the commands of America and implements is policies. His visit was therefore within this scope in order to draw Uzbekistan towards America in a stronger form. This is in the case where by this visit of his he provided a shining image of Karimov’s regime whilst covering up his crimes and what is considered to be violations of human rights whilst congratulating him upon his re-election for a further new term. America did not find it sufficient to improve the tyrant’s image by the visit of Moon but rather it preceded that by sending a judicial delegation, as was mentioned by the Uzbekistan news agency on 04/06/2015: “The Tashkent government association for rights held a meeting with a delegation of American law men which was headed by Mr Jeremy Fogel the director of Federal Judicial Centre in the United States of America. And during the meeting it came out that in Uzbekistan and in the context of democratic reforms and civil society development, fundamental reforms took place in the judicial rights system and the preparation of trained personnel in this field”. This has all been undertaken to provide a shining image of the tyrant as if he has a judiciary and law and not repression and brutal savagery! 4 – However this does not mean that America is completely secure from Russia’s influence or intrigues towards Uzbekistan. This is because Russia has attempted and continues to attempt to strengthen its relations with Uzbekistan and to draw Karimov towards it. Therefore in spite of Uzbekistan’s withdrawal from the ‘Collective Security’ treaty, which is the military-security arm of the ‘league of independent states’ in the middle of the year 2012, it is still however a member of the Shanghai organisation in which the Russian influence is well known. Indeed this organisation met recently on 08/07/2015 and during it on 10/07/2015 Putin met with the tyrant of Uzbekistan. The meeting dealt with the situation of bilateral relations between the two countries in the case where Putin invited Karimov to undertake an official visit to Russia in light of the two states celebrating the 10-year anniversary, in this current year, of the convening of relations of alliance between them. Russia is considered to be one of the most important partners of Uzbekistan within the economic, trade and investment fields. The level of trade exchange between the two lands is increasing and in 2014 this figure exceeded 6 billion US dollars! It is worth mentioning that the Russian President Putin visited Uzbekistan at the end of the last year and announced the writing off 860 million Dollars worth of debt. It is not far off to see that this represents a step along the path of Russia’s attempts in the direction of gaining influence in Uzbekistan. Karimov did indeed say during that visit as mentioned by a Kremlin statement: “That Russia is always present within Central Asia and that its interests plated an important role in respect to consolidating stability” (DBA 122014/11). These attempts by Russia are clear to observers and as such the French Paris news agency, whilst it was reporting news of the elections on 29/03/2015, said: “The American assistances to Karimov are continuing and Russia has attempted to draw it once again to it. So Putin visited Tashkent in December in an attempt to convince Karimov to join Uzbekistan to the Euro-Asia economic union that Moscow leads. However Karimov rejected that claimed: “That he wants to maintain the independence of his country and keep it far away from political blocs””. As such Russia has not given up in its attempts to restore Karimov to its own yard and so it is working to strengthen the bonds with it despite knowing the strength of its relations with America. 5 – There is no doubt that America realises the attraction existing between Russia and Uzbekistan however the balance is strongly tilted towards America and it is possible to say that it is content with the strength of its influence in Uzbekistan. However at the same time it understands that Russia will never abandon Uzbekistan easily. As such the preponderant view is that the successive visits from American officials to Uzbekistan have been undertaken to give support to the tyrant, consolidate him and improve his image in order to provide him with continuously ascending boost of power. It is as if America is saying to him to not dear Russia… because we are around you, in front of you and behind you. All of that is in order for its influence to continue in Uzbekistan and to safeguard it from any danger that is coming or harm that may come from Russia. Secondly: As for what you have asked in regards to the daughter of the tyrant and her relationship with Russia and that this is the reason for her house arrest… Then this is not likely because her conduct does not befit and qualify her to be relied upon by the Russians in order for its interests to enter Uzbekistan. She is closer to indiscretion, recklessness and corruption than to being a person fit for politics and ruling. It is most probable that her reckless behaviour and conduct and her falling into corruption are what has made her father impose house arrest upon her fearing the effects of her corruption upon his rule. Her financial scandals crossed beyond Uzbekistan into Europe and America to the point where these scandals spread like wildfire. The France Paris news agency mentioned in its news report that we quoted above during its covering of the elections on29/03/2015: “That an investigation has been opened due to her relationship with criminal gangs and business men from her partners” and the news agency added: “… And some observers say: That Karimova has reached the extent of her authority and it is not known whether the president distanced her due to prior thinking or planning or if he did so reluctantly. However he considered that the position of his daughter could lead to the undermining of the stability of his regime and he placed the interests of the regime above every other consideration”. And it added: “She has been accused of corruption and she has come to be pursued by a large number of European judicial departments under the accusation of embezzling 300 million dollars from the Swedish telecommunications company TeliaSonera that operates in Central Asia”. In addition the spokesman speaking on behalf of Swiss Justice Office throughout the charging of the daughter of the tyrant with corruption refused to disclose the amount assets tied to Karimov’s daughter which its country is holding however he indicated that it is less than $640 million and this is the figure that a number of journalistic reports has mentioned. In summary, that daughter is drowning in corruption and it is very unlikely that her house arrest was due to her connection to Russia. Rather it was because the stench of her scandals had blocked up the noses and so her tyrant father feared that this matter would have an effect upon his throne and topple him. He therefore saw it best to restrain her by way of house arrest extending to the age of his rule…! 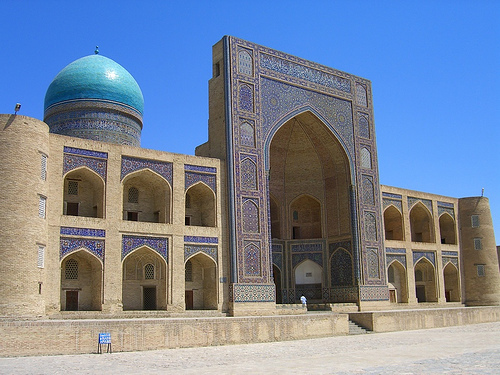 And the final conclusion is that the people of Uzbekistan are holding on firmly to their Islaam and the oppression of the former communists and their repression did not diminish their resolve nor was it weakened by those followers who came after them who wore the clothing of secularism and liberalism… In Uzbekistan there are real men who are not distracted or diverted by business or trade from the remembrance of Allah. These are men who have been true to the covenant that they made with Allah. Among them is he who has fulfilled his covenant and among them is he who awaits (his chance). And they did not alter (the terms of their commitment) by any alteration. They are men who carry a Da’wah; serious, diligent and assiduous. They are men who connect their nights to their days in the tireless work to resume the Islamic life through the establishment of the rightly guided Khilafah State. The tyranny and oppression of the tyrant of Uzbekistan will never weaken their resolve and determination just as his massacres will never weaken them. Indeed it will not be long by Allah’s permission until Allah Almighty All Powerful will deal a mortal blow and break the back of the tyrant and the backs of his accomplices and colonial masters. Then Bukhara, Tirmidh and Samarqand will shine bright once again and the Khilafah will shine over Uzbekistan and Central Asia and all of the Muslim lands. Previous PostO Hasina! Your Shameful Detention of the Female Dawah Carriers of Islam will only Strengthen the Call for the Khilafah!